I must admit I was a bit hesitant to read this when it was recommended to me, as it really is an old book! It was first published in 1936 it has sold over 15 million copies. However, I took the plunge and bought the audio book to listen to in the car. A few days of commuting later I was done; and I have to say I can see why it’s a very influential book! 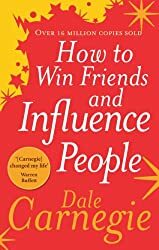 Whilst there’s nothing in it which is ground breaking or will blow you away, it just highlights the things we probably all know (but often forget) about dealing with people. In summary, be nice to people, think about what THEY want, talk in their language, present the positives, listen and smile! Nothing here is rocket science! OK, the language used is somewhat old fashioned and some of the examples are cringe-worthy, but it really is good stuff, and I think it should be a must-read for everyone in business. If you want to read the book (and I do recommend it!) – you can get it here! The future of prosthetics: #wiredhealth speaker Nigel Ackland on life with a bebionic hand http://buff.ly/1DaOceE. Book now. Fully Graphical Emails – what are they good for? The World Wide What? Where would we be without the web?